Distracted driving is described as an epidemic sweeping our roads. This topic is receiving much attention internationally and we would like to discuss in this section of the Arrive Alive website the global impact and the risks of texting and driving! It has been revealed that distracted driving in the US has claimed thousands of lives and injured a half-million people during 2008. In the past, there has been debate whether communicating from a vehicle might be a manageable risk – today, with the dramatic increase in the use of hand-held devices it is accepted that one method of communicating – texting- has the potential of creating a true crash epidemic! Vehicle manufacturers have joined the call to ban drivers from text messaging with cell phones and other hand-held devices. The wireless industry including cellphone manufacturers, carriers, and some Internet companies have expressed the belief that texting "is incompatible with safe driving." It is estimated that there were more than 1 trillion text messages sent and received on wireless devices last year, including cell phones and smartphones. At Government level in the US, the Obama Administration and Congress have addressed texting and distracted driving and all government employees are now banned from texting while driving whenever they are on the job, driving a federal vehicle, or using a government-supplied cell phone. This executive order affects nearly 4.5 million employees across the US, including postal workers and military personnel. The simple truth is that roads are already dangerous enough with many existing threats to road safety! When we add cell phones and text messages to existing road risks, we are taking this beyond anything we should be dealing with on the roads. A study recently released by the Michigan State Medical Society claims that texting while driving makes driving six times more dangerous. The National Highway Traffic Administration puts cell phone use at the top of the list of driver distractions. The Medical Society believes that texting while driving as part of cell phone use makes this act the most dangerous of all distractions. It's incredibly dangerous, and it's incredibly poor judgment to text while driving! Distractions include eating or drinking a cup of coffee or adjusting the channel on your radio. You can be distracted by an iPod that's not playing what you want, or a passenger, or a map or paper with directions on it. You can be distracted by a sports game on the radio, roadside distractions etc. Most of the research on texting and driving is done in vehicle simulated driving conditions. Drivers are tested with motion sensors and computer graphics creating realistic motorway routes. Some tests done in simulators suggest that talking on a phone, no matter how it's done, sharply elevates the risk of an accident. Researchers studying brain imaging documented that listening alone reduces the amount of brain activity associated with driving by 37%. According to the US Department of Transportation, there were at least 515,000 injuries and 5,870 fatalities in the US in 2008 as a result of distracted driving—these numbers are taken from police reports, so the actual numbers could be quite a bit higher. Even though there might not be sufficient statistics on how many people are driving and texting, there is enough information to say that texting shouldn't be permitted while driving! Drivers generally understand that drink-driving is a serious risk, but have less of an understanding of the dangers of texting. Those who are aware of the impairment to their driving are not aware of how great this impairment is. The Transport Research Laboratory found that motorists who use their mobile phone to send text messages while on the road dramatically increase the likelihood of collision. Studies have suggested that texting while driving is riskier than driving under the influence of alcohol or drugs. A combination of factors leads to impairments of reaction time and vehicle control which places the driver at greater risk than having consumed alcohol and getting behind the steering wheel. But what are these risks? Some safety advocates argue that the mere act of talking to someone, not in the car—whether the phone is up against your head, or in a cup holder while wearing an earpiece—is a risky overload of a driver's cognitive functions. When texting, drivers are distracted by taking their hand off the wheel to use their phone, by trying to read small text on the phone display and by thinking about how to write their message. According to the National Roads and Motorists Association, text messaging drivers spent up to 400 per cent more time with their eyes on the phone instead of on the road. Texting reduces reaction times of drivers. The reaction times of texting driver deteriorated by 35 per cent, much worse than those who drank alcohol at the legal limit, who were 12 per cent slower, or those who had taken cannabis, who were 21 per cent slower. When texting, you tend to wander across the lane. The research found that drivers who sent or read text messages were more prone to drift out of their lane, with steering control by texting drivers 91 per cent poorer than that of drivers devoting their full concentration to the road. The Transport Research Laboratory concluded that text messages took on average 63 seconds to compose while the phone owner is driving- compared with 22 seconds when sent from a desk. In one minute, a car travels half a mile at town centre speeds and more than a mile on the motorway. Texting reduces the ability to maintain a safe following distance from the vehicle in front. It is important to consider the effect of texting as a driver distraction especially with a focus to our younger drivers. Teenage drivers are a particular risk group considering that according to research surveys the average U.S. mobile teen now sends or receives an average of 2,899 text messages per month, with many of these texts sent and read from behind the wheel! A recent Virginia Tech Transportation Institute study found that manual text messaging elevated the risk of a crash or near crash to more than 23 times higher than "non-distracted" driving. Researchers compiled real-world driving data from truck drivers over 18 months. The VTTI found in a study that covered a combined 6 million miles of driving that texting while driving is by far the riskiest cellphone activity in a car. The risk for a texting driver to cause a crash or near-crash event (in heavy vehicles or trucks) was found to be 23.2 times as high as non-distracted driving, while dialling was found to be 5.9 times as high, talking and listening 1.0 times as high, and reaching for or using any electronic device was estimated to be 6.7 times as high. This study found that text messaging while driving is significantly more distracting than talking or listening on a cell phone or reaching for an object. There was a limited data set made available for use of cell phones in light vehicles. The risk of a crash or near-crash was found to be 2.8 times higher when dialling, 1.3 times higher when talking or listening and 1.4 times higher when reaching for an object compared to non-distracted driving. The study also found that "texting took a driver's focus away from the road for an average of 4.6 seconds--enough time to travel the length of a football field at 55 mph." 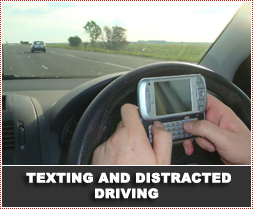 There is little doubt that texting is the riskiest of driver distractions. But how do we prevent this risk from escalating? No responsible motorist would drink and drive. We need to ensure that drivers understand that texting is one of the most hazardous things that can be done while in control of a motor car. Public service announcements can drive home the message to the public. Companies need to launch campaigns to warn cell-phone users, especially teens, about the dangers of texting while driving. Information about the dangers of texting while driving can be included in defensive driving classes. One of the best ways to curb texting while driving is to make it socially unacceptable, particularly among teens. A dramatic Web-based video depicting four deaths caused by a young driver who was texting at the wheel has provoked a debate over the best ways to curb distracted driving. The four-minute video, produced by local police in Gwent, Wales, has gone viral, attracting more than 1.5 million views on YouTube alone. YouTube has restricted viewings to those over 18 because of the bloody, graphic nature of the video. It has also required people to register before viewing it, although the video has been posted at the Gwent police Web site and elsewhere without restrictions. In a statement on its site, the Gwent police department said it is hoping the video can be used in schools across the U.K. to deter texting while driving. The Gwent police helped facilitate the filming of the video, including the auditions of 300 teenagers from Wales, "because we want to stop ALL drivers, but particularly young and new ones, from causing accidents," the statement said. Despite the criticism, some psychologists see a valuable place for dramatic presentations like this graphic video produced by police in Wales, arguing that such tools can have an impact in educational settings, especially on young drivers. Parents who choose not to expose their kids to the video should find ways to deliver the message some other way—and hope that popular figures whom kids take more seriously deliver it as well. Texting while driving is a difficult offence to enforce and prosecute. Despite it being illegal for a motorist to use a handheld phone behind the wheel, the RAC Foundation said that nearly half of the British drivers aged between 18 and 24 admitted to texting on the roads. Yet only 144,000 people were prosecuted for using their mobile while driving last year. Legislation has been changed so that motorists who cause a fatal accident while using a mobile phone can be jailed for up to five years. Previously the maximum punishment for similar crimes was a £5,000 fine and points on the driver’s licence. It is expected that other countries will follow the example of stricter enforcement and law changes to address the risks of texting and driver distraction. Can more technology assist in addressing these risks? Some road safety experts favour more laws banning texting while driving, while others tend to favour technology that disables wireless service in a moving vehicle. Automakers and their suppliers are working on systems that will allow drivers to send and receive text messages using voice-activated systems. There is a strong view that since the laws are hard to enforce, new and advanced hands-free technology will be all that more important. At a recent Distracted Driving Summit held in Washington, it was emphasized that there is a need for a greater understanding of the dangers of distracted driving. Considering all the possible dangers associated with technology (inappropriate material, online and game addiction, online fraud etc) nothing is riskier than texting while driving. Perhaps the important truth confronting us all is that texting while driving is not only a risk to the perpetrator but to all innocent road users! Driving while typing out text messages on a mobile phone is dumb, potentially deadly and should be against the law – everywhere!